In manufacturing industries, an incentive is a factor (financial or non-financial) that enables or/and motivates a particular course of action or counts as a reason for preferring one choice to the alternatives. Eventually, incentives' aim is providing value for money and contributing to organizational success. 1. Remunerative incentives or financial incentives are said to exist where a worker can expect some form of material reward, especially money, in exchange for acting in a particular way. 2. Moral incentives are said to exist where a particular choice is widely regarded as the right thing to do, or as particularly admirable, or where the failure to act in a certain way is condemned as indecent. A person acting on a moral incentive can expect a sense of self-esteem, and approval or even admiration from his community. 3. Coercive incentives are said to exist where a person can expect that the failure to act in a particular way will result in physical force being used against them (or their loved ones) by others. 1. Straight piece rate: In the straight piece rate system, a worker is paid straight for the number of pieces which he produces per day. In this plan, quality may suffer. Usually, in the garment industry, this incentive system is in use but this system promotes only productivity, not the quality which is a prime objective of garment manufacturing. This incentive system is much suited with the contract workers where management wishes to get maximum output with the limited number of working hours. 3. Differential piece rate system: A system which suggests that there should be a separate rate for 70%, 100% and 120 % of target level. In this type of structure, fresher could hardly survive. Output standards are based upon previous production records available. Here management also shares a percentage of bonuses. Here the incentives are given on the basis of time saved by the workers on a fix same wage rate. Here workers get motivates for doing the work with more efficiency but after a long time, workers use to be unsatisfied and demand more profit share through their works. 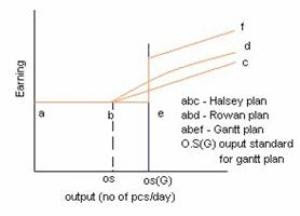 Unlike Halsey Plan gives a bonus on (S-T)/S, thus it can be employed even if the output standard is not very accurate. According to the Halsey plan, the workers will get more if they will do more but the quality of work might be distorted with the aim of more production. But with Rowan method, if the time saving is more than 50% of the standard allowed time then the bonus will be reduced. It means there are no benefits to do work with super high efficiency because it will affect the quality level of the production. 6. Bedaux Plan: Like other plans, the minimum base wage is guaranteed. ‘B’ represents a unit of work. 1 B stands for 1 standard work minute and it includes working time as well as time for rest. 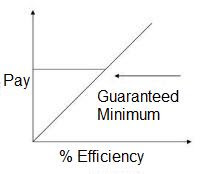 A worker earning “60 B “ per hours reaches 100% of standard output or 100 % efficiency. bonus as in the original plan is 75% of the number of B’s above 60 in one hour. 7. 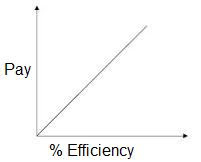 Emerson’s Efficiency plan: Workers with efficiency =67% to 100 %, an incentive is givens from 0 to 20%. For a 1% increase in output 1% increase in incentive. 8. Group Incentive Plan: Equal distribution of cash or shares between the team or group employees involved in a particular work. When a production line hit the target output and produces more pieces then they will get paid incentive accordingly. In the group line supervisors, helpers, mechanics and even floor in-charge get the share of incentive amount. Share percentage is kept different (less) for supervisors and managers than operators and helpers. Different types of incentive system used in the apparel industry (theory).